Sensei NXT 40 Tooth Professional Hair Thinning Shear is a new generation in ergonomic design. The first ergonomically neutral Rotating Thumb makes this the healthiest design ever. NXT means 80% less thumb movement required to open and close the blades. 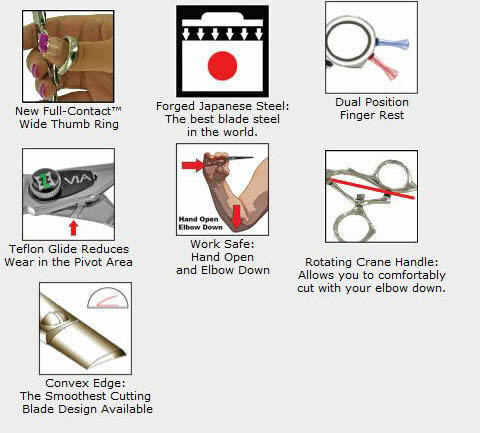 The new custom sized thumb rings provide wider contact surfaces to reduce contact strain. Pick the ring that fits your thumb and you can custom fit the shear without using plastic rings. This allows you to take full advantage of the wide sculpted thumb. This curved tooth blending shear cuts and combs out smoothly. You can also slide cut with this state of the art tool.